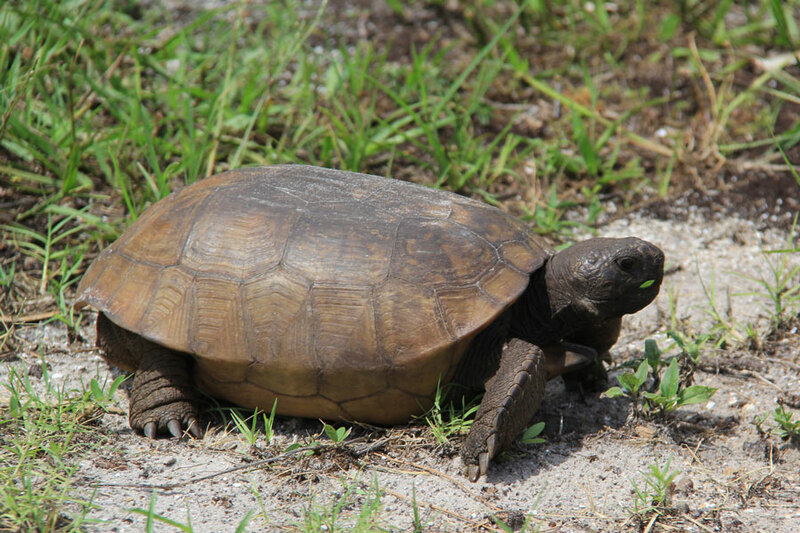 The gopher tortoise is faster than it looks. The air was hot and still, the ground dry and sandy. High above in the clear blue sky the shrill cry of an occasional osprey broke the silence. We were hiking along a secluded trail through the slash pines and palmettos when we noticed something moving rapidly through the sparse undergrowth. My first thought was rattlesnake. The park signs caution visitors to stay on the paths to avoid this danger. But our son was with us, and he’s been throwing caution to the winds since he was very young, so off he went. We caught a glimpse of the creature, a tortoise, motoring with surprising speed over the sand. We tried to keep it in sight, but within seconds it vanished. Then I happened to see a tunnel entry, perhaps a foot wide and tall, only slightly obscured by the rough grass growing beside it. I was elated to have finally seen the Florida state tortoise in the wild. Sightings are more rare than they once were, as the gopher tortoise, like so many other Florida native species, is endangered. Threats include loss of habitat, predation from other creatures, and humans, who continue to catch the tortoises to keep as pets or to eat, even though both these activities are illegal. No wonder gopher tortoises spend most of their lives in the tunnels they dig. Often ten feet below the surface and as much as forty-eight feet long, the tunnels are used by hundreds of other small animals. Because of this the gopher tortoise is considered a keystone species. Its presence in the neighborhood has a ripple effect that supports the entire local ecology. I guess the humans who trap and eat gopher tortoises don’t care much about such issues. I wish they did. I wish that mere legislation were enough to stop the damage we humans continue to wreak on our splendid planet. I realize that in the big picture a small tortoise doesn’t grab the public imagination the way, say, a horde of zombies, or a deadly contagion does. We humans tend to be self-centered and hot-tempered, a lethal combination. We treat each other with such savage disregard, I shouldn’t be surprised at our cavalier attitude to the environment which sustains every living thing. A gopher tortoise looks for all the world like a little tank. You’d think that would be enough to keep it safe. If things keep on the way they’re going, we may all wish we had our own personal tanks. 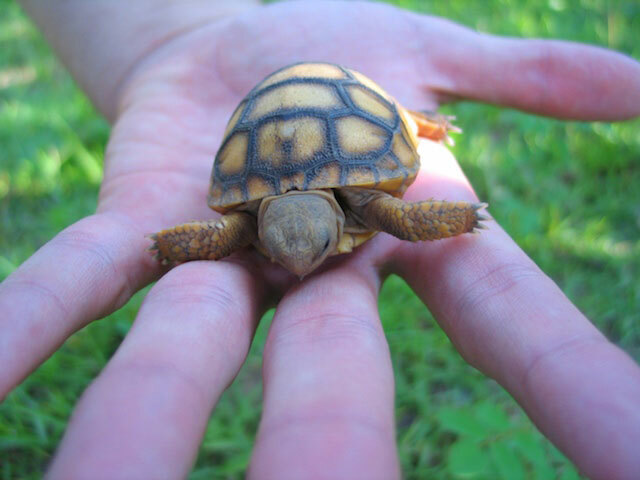 A baby gopher tortoise is as cute as any panda. Photo by Steve Beger.